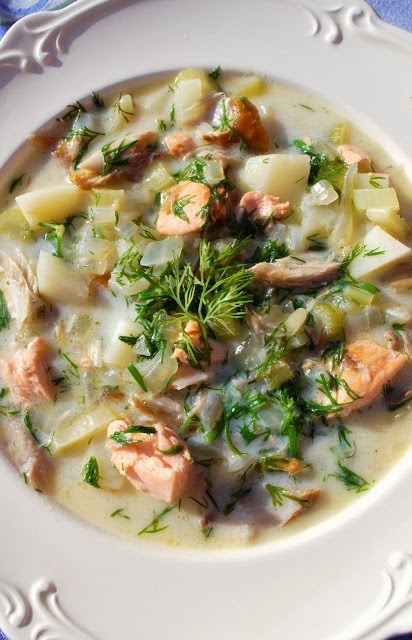 Dill is the perfect partner in this light and delicious Smoked Mackerel, Salmon & Potato Chowder. Chunky and full of flavour, surprisingly this recipe doesn't use cream or butter, so it's lighter in calories than a traditional chowder, yet hearty and robust enough to be a completely satisfying meal in itself. Celery and onion are first sautéed with a little olive oil, then a dash of flour is added to thicken the sauce. 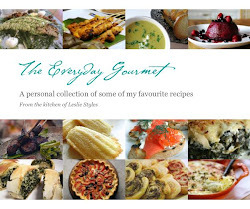 Chicken stock and milk provide the light base for the broth, diced potato anchors the chowder, the fresh salmon and smokey mackerel provide the punch, and a handful of dill towards the end 'seals the deal'. Refreshingly light and enormously flavourful, this Smoked Mackerel, Salmon, Dill & Potato Chowder satisfies the tummy while being flattering to the waistline. Heat the olive oil in a large saucepan. Add the celery and onion and sauté over medium heat until translucent, about 5 minutes. Stir in the flour and bring to a boil, then reduce the heat to low and cook for 3 minutes, stirring occasionally. Add the stock and potatoes, season with salt and pepper, and bring to a boil. Reduce the heat, cover and simmer for 10 minutes, until the potatoes are just tender. Shred the salmon and smoked mackerel quite roughly and add to the soup. Simmer 3-5 minutes, until the fish is cooked through. Stir in the milk and dill and cook on low until warmed through. Adjust the seasoning and serve.